4) Accuracy: 1.5? 1.5 ? 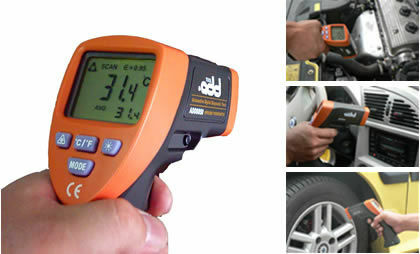 Infrared thermometer measures the surface temperature of a n object. The units optics sense emitted, reflected, and transmitted energy which is collect and focused onto a detector. The units electronics translate the information into a temperature reading which is displayed on the unit. For increased ease and accuracy the laser pointer makers aiming even more precise. 1) EMF ( electro-magnetic fields ) from arc welders, induction heaters. 3) Dont leave the unit on or near objects of high temperature.